It’s bracelets on the bead table this week. I just finished two pieces done in right angle weave (RAW) and cross weaving. Both pieces use the 2-needle technique. When I made my first 2-needle piece some years ago I was forever tangling threads and needles and generally making a mess. Perseverance paid off. I finally mastered it (more or less). For some pieces it may not matter whether you use one or two needles. These bracelets, however, depend on keeping an even tension so two needles it is. The bracelet is finished with an easy-on/easy-off snap clasp, sometimes called a ball-and-socket or trailer hitch clasp. A note: If you’re buying these clasps make sure they really are easy to open. I tried some in a bead store and found them extremely difficult. Anyone with arthritic or stiff fingers wouldn’t have been able to open them. Like most things, it’s buyer beware. 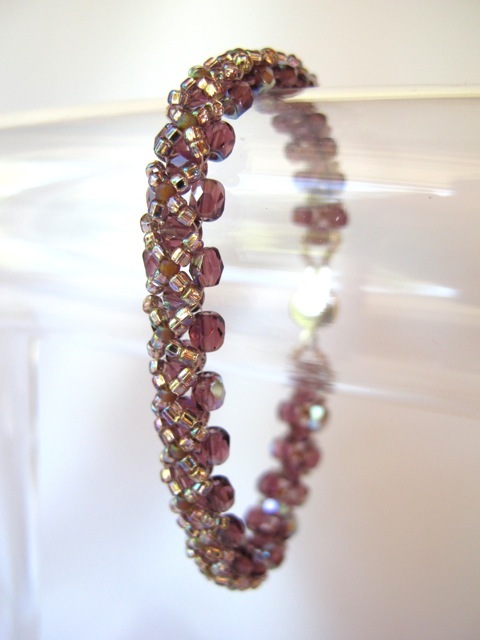 Categories: Bracelets | Tags: beadweaving, right angle weave, snap clasp | Permalink.